The Greek sextet QUADRUS is a Symphonic/Progressive Metal band formed recently, in 2014. Upon formation, they immediately began work on this concept album, which was released in 2017. “Entropia” deals with the “story of mankind and the endless circle of human interdependence with the universe! How it all began? How we fell? How we turned our positive vibes into dark matter against our own self? How our own hatred became one with us and slowly rotted us from the inside? What is the meaning of life? Is there any way for redemption?” These puzzling questions seem unanswerable, but pondering them forces us to use our minds and can be a useful exercise. The songs and lyrics deal with these themes on the album, and range from a short two-and-a-half minutes to the 18 minute opus of the title track. “Astral Nova” opens with the line “here we are again, standing before our destruction. The sterile, almost computerized female voice that narrates the opening is like a voice from the recesses of space, sent through a wormhole to welcome you to the journey. The ominous drumming is a nice build up as well, with symphony joining in, like the precursor to a charging army, for glory and honor. “Shadow Provision” leads in with strings of a harp, swirling keys, glittering guitars and a sonic boom. The steady, charging rhythm is with the genre of Power/Progressive Metal, with of course the Symphonic elements in support. Clean male and female vocals trade off as they discuss the idea that we have lost our humanity. Both vocalists are very capable of negotiating the upper ranges, and add beauty and grandiosity to the dark power of the song. A pair of solos from the guitar and keys round out what is a wonderfully crafted track. “The Alpha Origin” talks about how vengeance and “an eye for an eye” mentality has made redemption out of reach. The song starts out instrumentally, establishing a prophetic sound, and we then hear a trifecta of vocals, with harsh male vocals and cleans from the duo of Misailidou and Soto. The progressive elements come from the polymetric rhythms for the most part, with sweeping orchestral arrangements. Mandolas hits the skins hard as well, with a palate of different methods to keep those rhythms driving, and Konnaris provides the lead guitar pyrotechnics. The closing section highlights the darkness that has seeped into our minds and made us resort to vengeance as a way of settling things, which will ultimately bring us to our doom. “Sense of Matter” speaks softly at first through piano and voice. The opening lyric lines, delivered in both clean and harsh vocals, croon “walking the shadows, of anguish and pain, I am casting the line of my life. I am fading away! I am still here, consuming so many lives, so many lies I am bleeding I am learning my soul is laughing in disguise, so sick and so tired of looking at those faces , destroying themselves for greed and lust, look in the past.” The song is thick with guitar and a foreboding sound. “Alternative Hypothesis” is an instrumental segue of sorts. The chanting and staccato strikes give you a sense of reaching a breaking point where the wall that held back the water cannot support the weight of what has been done, and the inevitable change has come. “Deceptive Projection” deals with the notion that we can no longer accept the deception in our minds, and must seek the truth via the path of righteousness. Again, a variety of meters allow the story to take shape with texture and layers, ever-moving and shifting. The contrast between the harsh and clean vocals is like the battle of the concept album itself, between darkness and light, between right and wrong, between redemption and condemnation. “Attribution Theory” in psychology is a theory that “supposes that one attempts to understand the behavior of others by attributing feelings, beliefs, and intentions to them,” or the idea of trying to explain why ordinary people do what they do, based on their personality. The song’s theme is centered around the idea that self-realization is really the only way to address the acceptance of change for the better. There are a variety of instruments pushing the sound here. The opening is fierce and confrontational, like your inner self trying to move you to an action that you know you must take but are afraid of that first step. The organ notes here are just wonderful, as it the instrumental pause following the four minute mark. It’s the glimpse of beauty and righteousness that will fuel your movement. “Aggression” is a pure concept; something that is simple to understand. It’s the elementary way of dealing with something you don’t like, or something that confronts you. But being born with a mind to process thoughts and emotions, it’s also the easy way out. Oddly considering the title, the song itself is a more moving eight minutes of mid-tempo guitar, key and vocal melodies without that fierce bite of aggression. 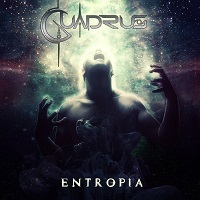 The title track, “Entropia,” is an eighteen-minute oeuvre, in seven movements (Atom, Epiphany, Cosmos, Shadow Light Spirituality, Justification, Elevation, and Redemption). The opening narration discusses the discovery of Earth like planets, and natural disasters occurring here at the same time. There is a long instrumental lead in before we hear some harsh vocals, and a palatial and lofty story of a spiritual awakening leading to redemption. Though it’s a long and complicated song with a bevy of various elements, stick with the waves as you ride them through because the destination is worth the journey. Wow—I needed a breath after all of this. I can see why the composition of this concept album was so long in the making, because they have meticulously crafted a tale that is riddled with emotional peaks and grandiose symphonies, where the themes are echoed in the music. Like a fine wine, this not an album for the feint at heart or for those who can’t grasp a higher order of music, or appreciate intricate and sophisticated architecture. It’s also an album that will immerse you in the story and urge you to a better sense of yourself. Bravo!